This image from NASA is very compelling. It contrasts the average makeup of the Arctic icesheet between 1985 and 2000 with the situation this year, in terms of how old each section of ice is. Whereas the 1985 to 2000 average included a large are of ice six years or older, the entire region of multi-year ice (two years or older) is about the same size today. Between 1985 and 2000, most of the ice area was more than two years old. Now, most of it has only frozen since this past summer. Given how cold this winter was – largely due to La Nina – this summer may be especially instructive. If we see an ice minimum similar to last year’s aberrant plummet, we will need to start worrying a great deal about the short-term viability of the icecap. The Arctic is losing its old, thick ice faster than in previous years, according to satellite data. What would an ice-free arctic summer feel like in somewhere like, oh say, Vancouver? Do they have any predictions for the type of temperatures we’d be likely to expect? Also, does the arctic melt flow (or its potential lackthereof) affect thermo-haline circulation in any significant way? I haven’t seen any specific discussion of this, though I would certainly be interested in it. An ice-free Arctic would absorb more energy from the sun, but I am not sure what the overall short-term climatic effect would be on a place like Vancouver. It’s a fair bet that air and water circulation patterns would alter somewhat. This is potentially of concern, since older sea ice has had most of the salt forced out of it. As such, its melting reduces the overall salinity of the ocean. I don’t think there is a great deal of confidence within the scientific community about where tipping points lie in terms of salinity changes and the THC. WASHINGTON (Reuters) – Arctic sea ice has thinned dramatically since 2004, with the older, thicker ice giving way to a younger, thinner kind that melts in the northern summer, NASA scientists reported on Tuesday. Researchers have known for years that ice covering in the Arctic Sea has been shrinking in area, but new satellite data that measure the thickness of ice show that the volume of sea ice is declining as well. That is important because thicker ice is more resilient and can last from summer to summer. Without ice cover, the Arctic Sea’s dark waters absorb the sun’s heat more readily instead of reflecting it as the light-colored ice does, accelerating the heating effect. 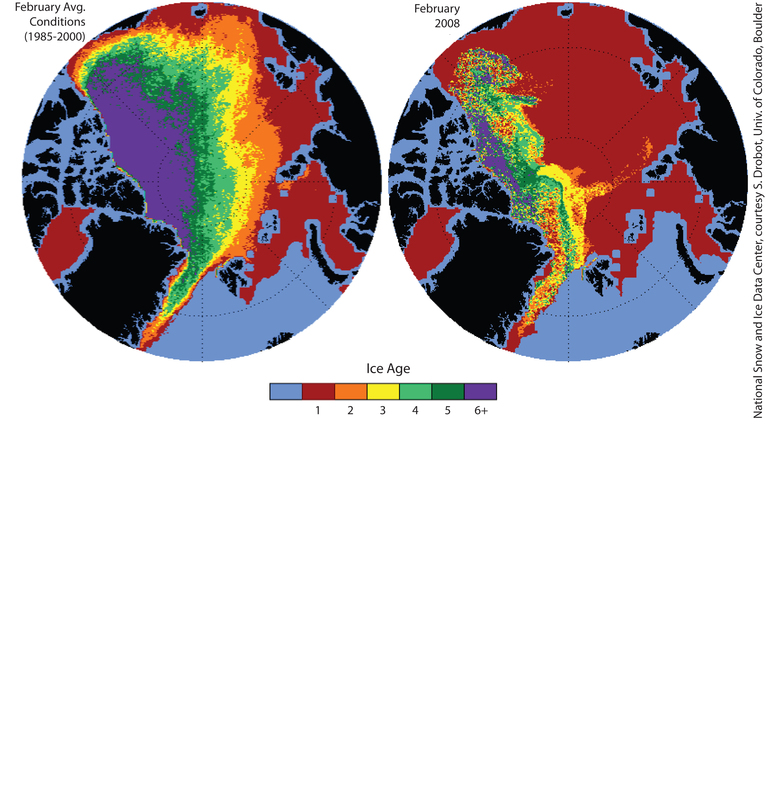 Using NASA’s ICESat spacecraft, scientists figured that overall Arctic sea ice thinned about 7 inches a year since 2004, for a total of 2.2 feet over four winters. Their findings were reported in the Journal of Geophysical Research-Oceans.